The MagicPlan app allows users to hold up their phone and then scan the dimensions of the room around them in order to create an instant floor plan that can be exported to various formats, including DXF, PDF, JPEG and HTML, the latter for viewing the plan on the web. To perform the scan, the app “sees” the room in the camera’s viewfinder, and then you tap on the screen to label things like corners and doors. This March the app’s makers Sensopia rolled out version 3.0 of the MagicPlan software, and announced a key partnership with Home Depot. Through this agreement, users could share their floor plan with Home Depot and make an appointment with an associate who would then use the plan to better assist the customer while in the store. Sensopia has raised a $1.2 million Series A round for its floor plan capturing application. Participating in the new round were Partech International, Tekton Ventures, Normandy Ventures, and other private investors. The company says it will use the funding to accelerate growth and further develop the application, making the software easier to use and allowing for the capture of rooms in three dimensions. The startup had released an updated version of the MagicPlan app around a year ago, which at the time had introduced an upgraded user interface, a full HD iPad version, and improvements to the “MagicPlan Cloud” service – a web service that allows for data-sharing with partners. Although consumers are, of course, welcome to use the app themselves for free (for non-commercial use), Sensopia’s revenue comes from its subscription plans and enterprise adoption. To reach its preferred market (i.e., paying customers), Sensopia is also releasing its MagicPlan software development kit today, which will allow MagicPlan’s technology to be integrated into other applications. The first customer to launch using this SDK is Symbility, a software company that makes claims processing applications for insurance companies. Symbility will allow its inspectors to create floor plans while on site, while completing a claims adjustment using their iPad. “It would not be a stretch to imagine that, in the future, claim management data for smaller cases could be generated by consumers, rather than the adjusters, and sent to the insurance company directly,” says Richard Adair, President and COO of Symbility. ”This would, of course, lead to significant savings in both time and money,” he adds. Until now, Sensopia had been operating as a bootstrapped company. CEO Pierre Gaubil explains, “we wanted to reach real traction before raising money.” Today, he thinks it’s there. The app now has over 4 million downloads and over 20,000 floor plans created per day, Gaubil also notes – up from a million when version 2.0 was released last April. He declined to provide revenue figures, but says growth is at 20 percent month-over-month. MagicPlan is available in the App Store here. 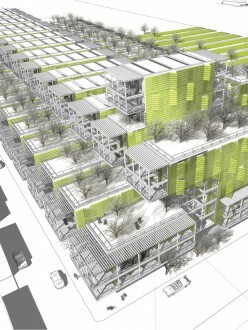 This entry was posted in BIM Software on May 29, 2013 by rumbelom. What’s new on SketchUp 2013! Trimble, the company that acquired SketchUp last year from Google, just made available for download the newest SketchUp update, several changes were introduced to the platform, which now goes by the name of SketchUp 2013. Here are some of the main news. SketchUp is still offered in two versions, free and paid, but the names have been changed: numbered versions are out (no SketchUp 9 for you), and in comes the year, but unlike most other software companies, Trimble chose to use the actual year of release as a reference, not the next year. Thus we have SketchUp Make 2013 (free version) and SketchUp Pro 2013 (the paid version). The differences between the free and paid versions remain the same: the paid version allows import and export of several formats, it includes SketchUp LayOut and Style Builder, as well as tools for creating Dynamic Components, advanced solid operations, among other features. SketchUp Pro 2013 now costs $590 for a license. The previous value was $495. This difference, according to Trimble, allows for the 2014 update. For $95 current users get updates within one year of the purchase, ensuring the update to the version to be launched in 2014. A new page entry was created, but after typing the desired search term, the next pages looked like the old site. Work in progress? This is a major change introduced. SketchUp now has its own app store (actually for plug-ins, now known as add-ons), the Extension Warehouse. It became much easier to search for new tools, download and install them. The installation takes place automatically and managing them improved considerably. I has always existed, but few people knew. SketchUp Viewer allows one to open SketchUp models (no editing). In the new site it appears listed prominently along the other SketchUp versions. A list of the major changes observed, as time passes we will update this section. – Change in the Toolbar menu: you now have more options to join, edit and even create new toolbars. – The Building Maker tool for modeling objects for Google Earth disappeared (by the way was not being missed). – The Solar North tool disappeared from the interface and became an extension that can be installed separately. – A plug-in (or add-on) called Advanced Camera Tools now comes installed with the program (but you can pretend you did not see it, if you want). – New Video export formats: Yay! Now you don’t need your friend’s Mac to export .mp4, H264 or other decent codec. Another cool thing is the ability to export the images separately for editing in a program like Premiere or Final Cut. – Now you can use dashed dimensions. – Multiple copies (arrays). Fantastic! – Pages always have numbers, even if you name them differently. Very good. This entry was posted in BIM Software on May 28, 2013 by rumbelom. BIM Day Out Sponsors Leica GeoSystems is co-presenting a webinar on the benefits of linking captured information with the information of an asset. The real “i” in BIM. Get a sneak peak of exciting presentations that Leica will be show-casing at the BDO in July. Improve your competitiveness with Intergraph and Leica Geosystems. World leaders in engineering software and high-definition surveying technology join forces to deliver competitive advantage by seamlessly converting the “physical” to “digital” for efficient and effective asset management. Intergraph and Leica Geosystems have brought the physical asset and digital asset together by utilising high-precision data capture devices and intelligent software. With the integration of Leica Geosystems laser scanning technology and Intergraph’s CADWorx® fieldPipe™ and SmartPlant® Enterprise solutions, it is now possible to analyse and convert intelligent digital deliverables for better asset management. Leica’s Australian partner C.R. Kennedy will showcase the latest laser scanning technology and Intergraph will demonstrate how captured data can be easily converted into intelligent data. A demonstration will be shown that combines the best of both companies by automatically linking captured information with the information of an asset. 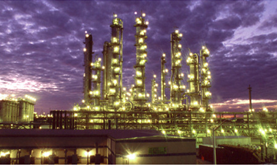 Organisations around the world rely on Intergraph and Leica Geosystems for the management of brownfield asset documentation, as-built verification and development while in the field, as-built development from point clouds, safer and more productive inspections, as well as capturing the physical asset and automatically linking all the data in one system. See what is possible when Intergraph and Leica Geosystems come together for a webinar on Tuesday, 28 May at 2pm AEST. Note: A time zone conversion chart is available on the registration page. Please register with your business email address for verification purposes. Feel free to forward this message to your colleagues so they can also benefit from attending this informative webinar! Visit our GetSmart! webinar page to see the upcoming webinar schedule and download previously recorded webinars. This entry was posted in BIM Collaboration, BIM in Construction, BIM Software on May 27, 2013 by rumbelom. Thanks again to Sally Darling and her team at ESD Solution for inviting me to present at the recent ESD Source event. It was great to see so many interested students and professionals attend and participate. Please see a collection of links and additional articles addressing some of my presentation material from the evening. Autodesk Video: “ThinkTank” – Project Chicago ESD Protype. At the Sustainability Summit at Autodesk, on January 27, 2011, Autodesk’s John Kennedy talks about building performance—conceptual energy analysis, Project Vasari, and the green building market. At the Sustainability Summit at Autodesk, on January 27, 2011, Autodesk’s Dawn Danby talks about the importance of teaching engineering and design students to build sustainability into their designs from the beginning, and the tools they need to get there, including the Sustainability Workshop. This is one of a set of videos from the Summit. Autodesk Green Building Studio is a web-based energy analysis tool that can help architects and designers perform whole building analysis, optimize energy efficiency, and work toward carbon neutrality earlier in the design process. In this webinar learn how Green Building Studio works, how to perform common tasks with the software, and how to understand energy results. Our team show you how best to prepare a BIM model for analysis, share hints and tips for checking model geometry, show you how to use our Revit® plug-in and much more! Concept The Concept plugin for SketchUp by Sefaira, Ltd. allows designers to quickly and easily create SketchUp models that can be analyzed by Sefaira Concept, a web-based whole building sustainability analysis tool built specifically for conceptual design. gModeller gModeller is an energy analysis plugin for SketchUp from GreenspaceLive. Based on the gbXML standard for designing resource efficient buildings and specifying associated equipment, gModeller enables building designers to decorate 3D SketchUp building models with gbXML surfaces and openings, to identify and label gbXML spaces, and to import and export gbXML models. IES VE SketchUp plugin The IES VE SketchUp plugin allows you to assign important sustainable design information like location, building type, room type, construction types and HVAC systems to a SketchUp model and then import it directly into an IES tool for analysis, without having to re-build any geometry. OpenStudio The OpenStudio Plugin adds the building energy simulation capabilities of EnergyPlus to the SketchUp environment. It allows you to create, edit and view EnergyPlus input files within SketchUp. Add as much extra detail as you need to zones and surfaces. The plugin also allows users to launch EnergyPlus simulations and view the results from within SketchUp. This entry was posted in BIM Conference, BIM Content, BIM Software on May 26, 2013 by rumbelom. DirtyBIM™: The Movie. BIM Collaboration from the Ground Up. The Civil Engineer, Urban Planner, Landscape Architect, and Surveyor are increasingly left out of the BIM Process. The traditional tools for civil design make it difficult for the site planner to engage in schematics and feasibility studies. In the design process weeks are lost when the cost of site changes are realised too far down the design development phase. So on the 8th of May we asked Matt Rumbelow (Building Specialist) and Shane O’Rorke (Civil Engineer) to go through the iterative process of looking at a layout with SITEOPS® to analyse changes, see costs and hand over terrain for use with Revit Architecture. There was a great response and we received a number of request for the recorded version. As you will see in the Welcome to DirtyBIM Recording, in addition to finding the least expensive way to balance the site, SITEOPS® allows Architects and Civil Engineers to explore more options and communicate with the end client in a fraction of the time, complete with visuals and detailed cost analysis. Please let us know if we can get you additional details around SITEOPS®. Also, we would gladly get you in contact with firms using SITEOPS® for help on your next project. Contact Kevin Murphy to learn more about this BIM enabling technology. This entry was posted in BIM Collaboration, BIM in Construction, BIM Software on May 21, 2013 by rumbelom. 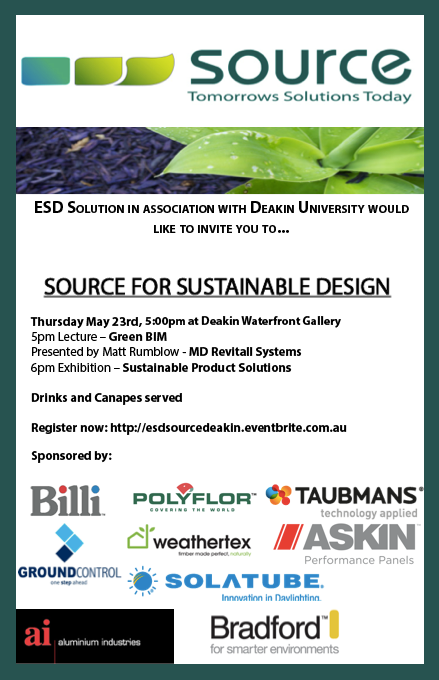 I have been asked to present to Deakin Uni students ( & the wider design community of Geelong) by Sally Darling and the team at ESD Solutions. If you happen to be in the area and would like to know more, register at the link below. This entry was posted in BIM Conference on May 21, 2013 by rumbelom. Are you a DAUG, a GUN, or an Idol?? The BIM Day Out is set to find out as it embarks on the first BIM Idol!! Thanks to the folk at KnowledgeSmart, we are pleased to announced the final in the “Trilogy of Testing”. KnowledgeSmart is the official platform of both the Autodesk University “TopDAUG”, the BIM Show Live TopGun, and now the BDO BIMidol. Do you have what it takes to “match properties” with the Best BIMbo’s in the business? This entry was posted in BIM Conference on May 12, 2013 by rumbelom.